My favorite announcement from SDCC 2014 was the upcoming Star Trek/Planet of the Apes crossover from IDW and Boom! Studios. Much like Devil’s Due, Boom! has done well for itself despite losing a major licensee (Disney in their case), doing so by absorbing fellow small company Archaia and by grabbing great tie-in licenses. Their gamble with getting the license for Robocop paid off as the remade film did well; it also allowed them to republish some classic comics kept in limbo as the rights shifted between almost half a dozen publishers. As a result, they were able to team up with Dark Horse, the original publisher, and finally put out a long-awaited trade of the classic Robocop vs. Terminator mini-series, collected for the first time since 1992. 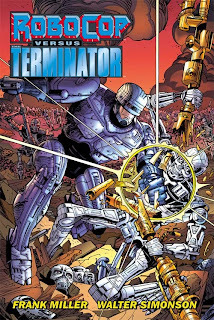 The trade dress for Robocop vs. Terminator sells the comic not only on the franchises but also on the merits of the creative team of Frank Miller and Walter Simonson. The very early 1990s was an interesting time for all parties involved: Miller had just split off from the Big 2 and was about to launch Sin City, and Simonson had just finished his run on Fantastic Four. While the Robocop franchise was on the downslide after its second film, Terminator 2 had come out in 1991 to massive acclaim. Dark Horse was still a rising power and their success with high-quality licensed comics was still seen as a bit of a fluke. But the Aliens vs. Predator comics had proven a great success ... could such a crossover work again? Well, let’s just say that I really want the next film in both franchises to adapt this crossover, as it combines Robocop and Terminator perfectly. It helps that both creators were able to bring previous experience into the mix since Miller had written drafts for the second and third Robocop films. Meanwhile, Simonson had done a complex time-travel caper in Fantastic Four and was the artist on the Uncanny X-Men/New Teen Titans crossover, one of the best Marvel/DC crossovers of all time. They used the presence of time travel as a central part of Terminator to their advantage and there’s a new timeline in nearly every issue. But this isn’t like Deathmate where conflicting details might cause alternate universes; it’s because of changes made to the timeline by the actions of Robocop, future humans, or Skynet’s Terminators. Robocop is the main character, but the Connors, the T-800 (Schwarzenegger) Terminators, and T-1000s aren’t involved in Robocop vs. Terminator. I’m not sure if this was personal preference by Miller, studio involvement, or just the comic being written too late to use the Terminator 2 concepts, but it feels a little weird nearly twenty years later. The main female protagonist, Flo, goes unnamed throughout most of the comic; I ended up calling her “Moe” for a while because of her bowl haircut. Like everyone in the 1980s and '90s, Simonson presumed that people in the future would wear giant shoulderpads. Despite some goofiness in her appearance, though, her characterization works as a war-torn, tired but hopeful assassin sent to take out Robocop so that his mind will never be used to create Skynet. The central conceit of having Robocop be responsible for the horrible future actually works in the context of both this comic and the films. We see him abused verbally by those he’s been created to trust and worn down by the grimness of New Detroit. Hook a depressed brain up to a powerful network and you’ve got a recipe for the homicidal Skynet. Some of the details about the brain link-up were from Frank Miller’s Robocop 2 draft, so I’m almost glad they didn’t make it into the film so that they could be used here instead. Time travel using both the actual time machine and the copy of Alex Murphy’s brain in Skynet’s system allows Robocop to pull off some impressive schemes against Skynet throughout the timeline iterations. The comic also has one of the greatest final pages in comic book history, which I’m not spoiling because you need to see the sheer audacity of what happens. Simonson’s artwork was recolored for the hardcover by Steve Oliff, who also remastered his The Mighty Thor omnibus and the recent paperback releases of that run. I didn’t like the reworking for Thor since I had already read it with the original coloring in the Marvel Visionaries trades. Since Robocop vs. Terminator is a new read, the enhanced colors don’t bother me quite as much, especially if they were done under Simonson’s instructions. No matter how they color it, his art is still glorious here. Robocop is a little burlier than I’m used to seeing but that happens in a lot of Robocop comics. I think it’s done because it’s harder to get the heaviness of the character across without the extra bulk. Of course, one of the biggest advantages of a tie-in comic is that there’s far fewer budget restrictions, meaning that Miller and Simonson can go all-out on the action. Remember how silly the flying scene looked in Robocop 3? Take that concept, multiply it one hundred times, come up with better flight rigs, and pit the Robocop army against thousands of Terminator endoskeletons, and you’ve got the incredible climax of Robocop vs. Terminator. One Terminator takes the form of a young child, a risk I don’t think the films would take, especially in 1992 after the seriousness of Terminator 2. Skynet takes to the stars in one possible negative future ... doing so in spaceships bearing massive, creepily smiling endoskeleton faces. This would look ridiculous from another penciller, but Simonson made it work. Not only is Robocop vs. Terminator an excellent crossover, but it’s a neat little time capsule of what comics were like back in the very early 1990s. Miller’s Sin City-era noir narration can grate at times, but it’s worth getting through for the art and the story itself. Next week: I am Groot! I'm not a huge fan, but I always thought Miller's Robocop vs Terminator was much better than it had any right to be. There's really no bottom to how bad that series could have been.